Today we have something different! I’m going to introduce the best blank guns for under $100 on the market right now. “But blank firing guns have nothing to do with airsoft Jukka?”. I know, I know, but hear me out for a minute. Many people look in to airsoft guns because they need film or theater props. Or maybe gear for reenactments and live action role-play. Airsoft guns are mostly replicas of real guns after all. For these uses blank firing replica guns might be sometimes better suited for the job than airsoft guns. Especially if you don’t need to fire plastic BBs at people and need some serious bang for the buck (pun intended). And if you are looking for a replica for these types of uses, you usually can’t spare too much cash on them. That’s why I thought a hundred bucks would be a nice cut off price. It’s enough to get you a decent blank gun replica that isn’t so cheaply made it’s dangerous but it won’t break the bank either. Lets start with a quick recap on what blank guns are exactly! Blank guns, also known as blank-firing firearms are weapons that fire blank cartridges that (obviously) don’t have a bullet but still produce the loud bang and flash. Blank firing guns are typically used for film productions, theater, military and police training, live action role play and as starter pistols in sports (not that much anymore). Blank guns can be roughly split into three categories. Front firing, top firing and real firearms. Front firing blank guns have an open barrel and firing the blank looks very similar to firing a real firearm. The muzzle flash will come out of the barrel and the action is very realistic. These are typically used in movies. They are however not capable firing a real firearm cartridge and generally have precautions so they can’t be easily modified to real firearms. Top firing blank guns are the typical start pistol without a real open barrel. The blank fires in the chamber and the expanded gasses are vented through gaps between the chamber and the frame. This results in a loud bang without the muzzle flash from the barrel. There are special blank cartridges for real firearms. Some blanks have just the bulled and most of the powder removed. This is usually enough to produce a loud report and flash but usually the pressure is not enough to cycle a semi-automatic weapon. This requires a muzzle adapter and special wooden or wax rounds that break at the muzzle adapter. Especially real firearm blanks are potentially lethal and should never be used for simulated firing towards other people (even though they do, at least in the military). They should be treated like live rounds. That takes us to the next important topic. Safety. Since blank guns use real gun powder they require a license or a permission from authorities in most countries and states. There’s a good reason for this. Even though blank firing guns don’t fire projectiles they posses great danger. Most front firing blank guns and blank cartridges for real firearms have something called a wad. It’s a plug made out of paper, wood or plastic that seals the gun powder in the shell casing. At close ranges this wad and the pressure from the blank can be potentially lethal or at least cause severe injuries. Especially for the eyes. That’s why it’s important to wear eye protection when using blank guns. There are several cases of actors getting killed by misuse of blanks. Probably most famous one is the case of Brandon Lee, the son of Bruce Lee. He was killed during the filming of the movie The Crow. This was because they used real firearms loaded with blanks during filming and one of the weapons had a real bullet lodged in the barrel. This resulted in the blank functioning just like a real round, expanding gasses forcing the bullet out of the barrel at high velocity with tragic results. The other threat blank guns posses is that they can be very easily mistaken for actual gunfire. This can make people worried and easily cause misunderstandings with the police. Ofcourse they can be used as deterrents and as fake firearms by criminals and this was especially common when blank firing guns didn’t require permissions. Thirdly they are as harmful to your hearing as real firearms. A single fired blank can cause permanent hearing damage if necessary hearing protection is not used. So if you use any sort of blank gun, please make sure you have all the required permission and that you understand all the necessary safety precaution before using them. So now that we have the important safety stuff under the way let’s look at the best blank guns for under $100 on the market today! A top firing .357 snub nose revolver replica that uses .380 blanks. At just under $90 this thing is a steal. Bigger brother of the previous revolver. A replica of a full size .357 Magnum Colt Python style revolver. Features a working single and double action trigger and a five round revolver. 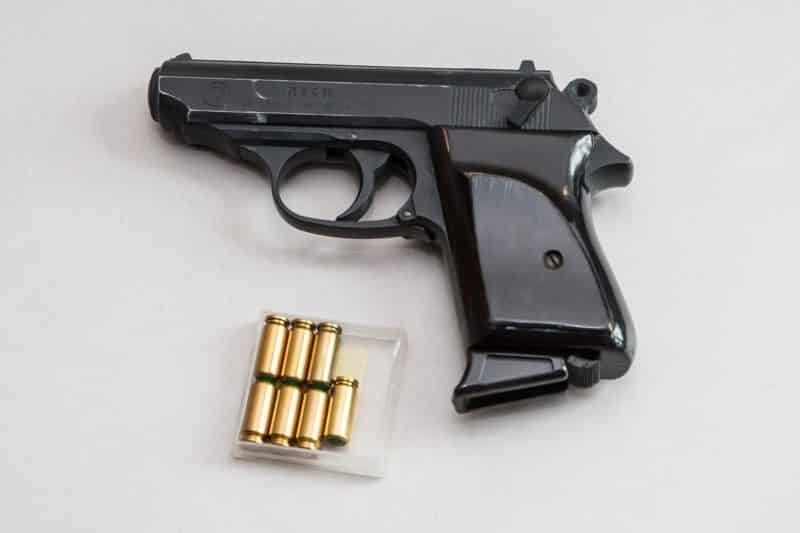 A compact sized semi-automatic blank gun modeled after the Walther PPK, made famous by James Bond in the original movies. Fire round as fast as you can squeeze the trigger, just like a real automatic firearm. I know I was supposed to stick to guns under $100 but for just a few bucks over you can fund some awesome front firing ones and a wider variety of models so I decided to include these. A semi-automatic top-firing blank gun modeled after the German Parabellum p.08 better known as the Luger. Great for WW1 and WW2 movie and theater prop. Fires 8mm blanks in semiautomatic. The R1 is a front firing blank revolver, modeled after a .357 magnum revolver. It has a six round revolver with realistic ejector. Now this is a bit more expensive but it is a solid front firing semi-automatic pistol, as realistic as can be. Modeled after the Beretta m92 or M9 widely used by the U.S. military and law enforcement. Disassembles like the real thing for cleaning and maintenance. There you have it! best blank guns under $100 (and a bit over). If you are looking for some great movie props give these a try. Please drop a comment if you have any questions and I will do my best to answer them. Although, I was of course aware that in movies they do not use real firearms, yet I wasn’t familiar with the term ‘blank guns’. Till now that is. Thank you for the article, I truly enjoyed it. Cheers! And have an Awesome Day! Hi Jukka, I know almost nothing about guns but enjoyed reading your informative post. It is highly readable and easy to understand. I love the sections on the individual guns as well. If possible the earlier portion could be broken down into more sections with sub headers, also do a second language/spell check! Thanks for the comment and tips Ferhat! Will check out your suggestions. Are biodegradable airsoft BBs any good? BestAirsoftGuns.net is a participant in the Amazon Services LLC Associates Program, an affiliate advertising program designed to provide a means for us to earn fees by linking to Amazon.com and affiliated sites. I.e. if you click an affiliate link pointing to Amazon.com and make a purchase, we will earn a small fee.